As you might notice my site is maintained by advertising, so please do not block ads on my site using Adblock or other similar ways. The only way to advertise went to your recipient is its displaying. You will not find on my webpage no pop-up or something like that. 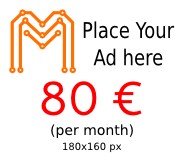 If you want to put your banner on my site (or any other form of advertising) please contact me via e-mail. I offer place for ad at a very favorable price.